Mixed Poppy is a delightful mixture of poppies with a wide variety of colours and shapes. The colours vary from cream to orange and from pink to red, with or without a white rim. There are both single as double flowers. Loved by bees. Flowers June-August. Height 40-50cm (16-20"); spread 30-40 (12-16"). Sow direct into finely raked, moist, warm soil where the plants are to flower at a depth of 6mm (¼") and cover the seed lightly with soil. Germination usually takes 10-14 days. Thin out seedlings if necessary to a final spacing of 20cm (8") apart, removing any competing weeds. 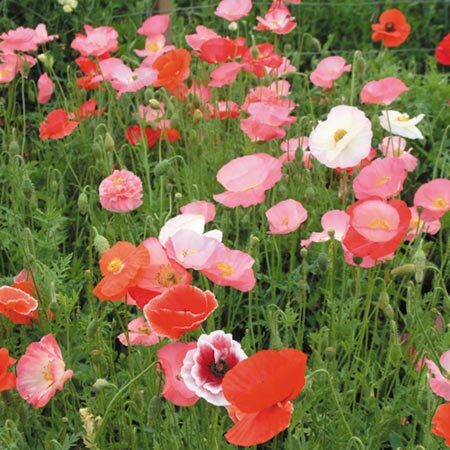 Seeds can also be sown in September for flowering the following year. Ideal for beds and borders, patio pots and containers, raised beds. Attractive to bees. Prefers full sun.